I have a thing for Cadbury Chocolate Cream Eggs. Yes, the ones with the creamy filling that looks like a runny egg. 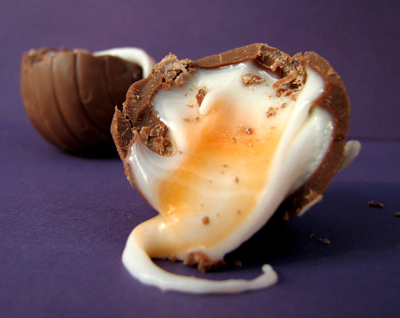 I absolutely love them and they only come out at Easter and I go a whole year without my Cadbury Cream Egg fix. 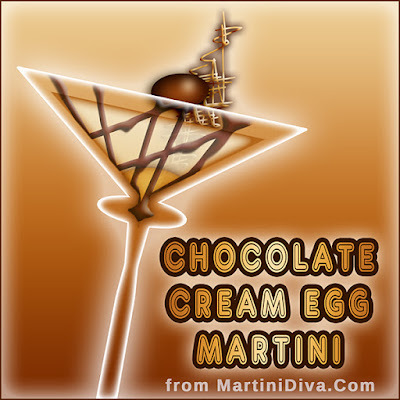 So I fixed my fix and created this Chocolate Cream Egg cocktail. 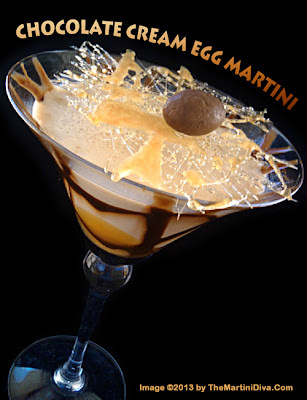 As you can see in my cocktail photo below I made a fun caramelized sugar decoration to top off my personal version of this Cadbury inspired Chocolate Cream Egg Martini. Admittedly these are not that easy to do and take some time so feel free to ignore and just garnish with just the mini Cadbury Cream Egg candy. Yes, of course, I included the surprise "yolk" . . . . look very close, at the bottom is a squirt of caramel to simulate that unique candy element! Chill your cocktail glass in the freezer for 15 minutes. Remove the glass from the freezer and quickly drizzle the chocolate syrup across the glass in several directions, then replace the glass in the freezer immediately to set the chocolate drizzle and chill the glass. Fill the cocktail shaker with ice then add the Crème de Cacao, Godiva Chocolate Liqueur, Bailey's Caramel Irish Cream and the whipped cream vodka and shake until well chilled. Take out your chilled glass and pour a good sized dollop of the caramel sauce into the bottom of your glass for the "yolk"
Gently pour your cocktail over the caramel sauce then place the caramelized sugar decoration over the glass and lay the mini Cadbury egg on the sugar garnish. Line a cooking sheet with parchment paper. Melt 2 cups of sugar with 1 cup of water in a stainless steel saucepan on medium high until the mixture turns a golden brown. It takes a while for the mixture to reduce down but once it does it can turn color extremely quickly and burn, be sure to keep an eye on your mixture as you don't want it to get too dark. Once your caramel has turned a deep amber, remove from the heat and quickly start drizzling designs with a fork on your parchment paper. Warning: Working with hot sugar is dangerous and can cause burns.